Alan Barnes (after "guesting" with Alan & The Craig Milverton Trio - Ilminster July 11). "Alto saxophonist Ben Lowman absolutely nails with his Maceo Parker inspired chops, that provided a killer solo on yesterday afternoon’s set." 7 Jazz Arts Centre, Leeds. "Skill so tight they cut off the circulation." “This band sounds Killing! Great compositions and playing." "Once the audience has recovered from their initial shock, Yoruba take them by the hand and show them exactly what Salsa is all about. Fabulous arrangements twist and turn fuelling the excitement and energy of the music. The rhythm section holds down, the groove whilst the three-piece horn section weaves through complex lines of beautiful harmony." As well as some of the above quotes I have also been fortunate enough to have been reviewed various jazz fanatics - please take a look below for some varying opinion on albums and gigs I've been involved with. "In preview Bebop Spoken Here advised early arrival. Minutes before the start of this gig in the upstairs room at the Voodoo Café it was standing room only. All seats taken, walls lined with dozens of people, some relegated to a spot in the corridor, numbers exceeding expectations. An air of anticipation, a ‘buzz’ in the air. Returning local hero Matt Roberts was to play the music of Fats Navarro. At a guess, his sextet’s average age would be little more than thirty, if that. And what a sextet! Familiar faces, some less so, six superb jazz musicians. Navarro, Tadd Dameron, Dexter Gordon, legendary names. Roberts’ band more than did justice to the bop era giants. Index introduced altoist Ben Lowman. The verdict? This guy is the ‘real deal’. A fabulous player, book him for your jazz club. Matt Anderson (tenor), to Roberts’ left in the frontline, has become well known to north east audiences. Several gigs in the region leading his own band or, as on this gig, as a sideman, his warm-toned tenor has become a familiar sound. Roberts couldn’t stop smiling; tenor to his left, alto to his right, a great frontline. In fact, it was smiles all round. These guys clearly enjoyed the music, working together and performing to a receptive crowd. Here’s a thing - a frontline working without mics. Old school or what?! The rhythm section cooked on Gas Mark 9. Sam Watts (keyboards), his face a picture of concentration, bassist Angus Milne as good a bass player as you’ll hear (a local lad to boot, from the Egglesciffe area) and drummer Sam Gardner. The tall, affable Gardner playing bop, now there’s a thing! Familiar on the scene in more contemporary contexts, the boy can play the music of the masters as well as anyone. Symphonette, Bird’s Dexterity, The Chase – this was bop paradise. Dameron’s blues The Skunk, ballads too – As Time Goes By, Gone with the Wind. A gig to treasure, from first note to last. Smiles on the stand, smiles in the audience, superb musicianship, The 2015 Darlington Jazz Festival is off to a flyer." Russell. 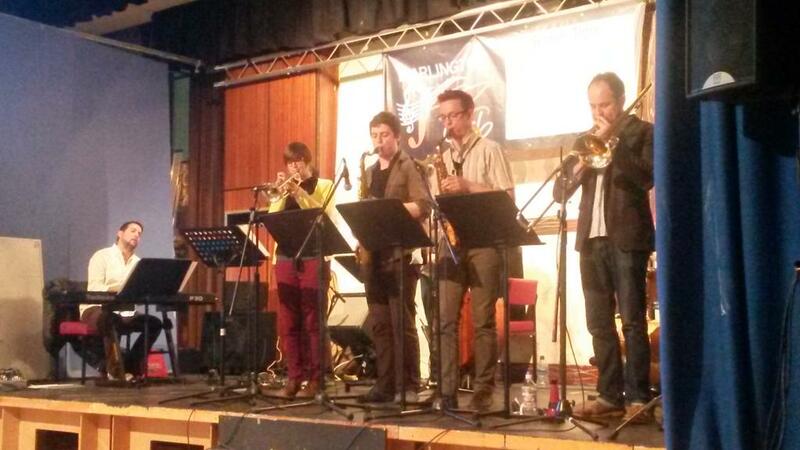 The festival’s now traditional closing event is programmed by Darlington Jazz Club. This year’s guests – the Simon Read Octet – have firm associations with the prestigious Leeds College of Music degree course. The west Yorkshire hot house has established a veritable conveyor belt of talented musicians. Bassist Simon Read leads a superb octet, playing his own compositions with a recently released CD – Times Leap – to tour. The assured Read has assembled a cracking outfit; trumpeter of the moment Laura Jurd, the brilliant altoist Ben Lowman, the equally brilliant Will Howard (tenor saxophone/clarinet), the nu-school guitarist Michael de Souza, the in demand Kevin Holbrough (trombone), pianist/lecturer Jamil Sheriff and ace drummer Sam Gardner. The set opened with the first track on the octet’s CD, Leaps and Bounds. Nicely warmed-up, Low Point raised the stakes with an exhilarating alto/tenor chase. An untitled number (Read confessed he struggled to come up with titles) and a brace of punning titles – Read Between the Lines and Read All About It (the latter with a swinging jam session feel to it) – gave scope to the soloists. All members of the octet are accomplished soloists. Jurd and Holbrough, flanking the demon reeds – Lowman and Howard – produced extended solos. The academic Sheriff long-since achieved grade eight and made a top-grade contribution throughout the set. A ballad – The Coldstones Cut – heard Howard on clarinet and, flying high on alto, Ben Lowman. Simon Says featured Jurd in an urgent, Mingus-inspired piece stoked by Read’s propulsive bass playing topped-off by Sheriff’s dazzling solo flight and Gardner’s unfailingly impressive drumming. Keeping together an octet for any length of time can’t be easy. It will be interesting to see how Simon Read’s project develops. This year’s Darlington Jazz Festival, the fourth, can be described as the best yet. The use of several venues in the town centre worked well. It is safe to assume that next year these venues will be supplemented by others. Darlington Jazz Festival wouldn’t exist but for an army of willing helpers, all giving freely of their time. From one venue to another young volunteers ran the show doing every job that needed to be done. The year round work takes the form of a fortnightly jazz club session. Small group performances can be heard in the Quakerhouse (Sundays, 5:30pm) and big band concerts will be staged at pop-up venues dotted in and around the town centre (also Sundays, 5:30pm). Check Bebop Spoken Here’s listings for details. The next one is a big band session on Sunday May 10 at The Keys on Skinnergate. The swinging Newcastle-based Strictly Smokin’ Big Band will be in town. Admission on the door: £5.00. & £3.00. Next year’s Darlington Jazz Festival, the Friendly Jazz Festival, is already in the diary." Russell. Laura Jurd - Trumpet, Ben Lowman - Alto Sax, Will Howard - Tenor Sax, Kevin Holbrough - Trombone, Michael De Souza - Guitar, Declan Forde - Piano, Simon Read - Bass, Sam Gardner - Drums. I'd been looking forward to getting this recently released album by bass player Simon Read as it features 6 of the best jazz musicians in the area as well as couple of excellent ones from London. To start with, the album looks great. It comes with some nice artwork on a digipack CD case. In this day and age, more and more musicians are on a tight budget making them release albums as download only. I'm a bit of a traditionalist and like an object for my money so I was pleased to get this album on hard copy along with a download for a mere £5. The album features 5 tunes, all with a different feel but there is a great sense of continuity on the record. The opener 'Leaps and Bounds' has a Latin groove with harmonies reminiscent of some of Kenny Wheeler's larger ensembles and has a great solo by the London based trumpeter Laura Jurd. My particular favourite is 'Vibe E', a heavy bass groove with a rock feel and catchy melody interspersed with moments of tranquility. Another gem is the final track 'Read All About It'. A blues where the rhythm section really swings underneath excellent bop solos by Ben Lowman on alto, Kevin Holbrough on trombone and band leader Simon Read. Now that Jazz Services have lost their funding, bands like this are going to rely more and more on releasing and selling original music. However, this isn't why you should buy this. You should buy it because it's an excellent record and well worth a listen. Yesterday was a celebration of Northern jazz musicians at the Thwaites Festival Pavilion. Manchester Jazz Festival hosted new and up and coming jazz artists, supported by the Jazz North northern line funding and promotion scheme. One of the youngest participants is Leeds bassist, Simon Read, whose octet has just released their first EP – Times Leap. It was during Read’s studies that the concept for the octet first came to fruition. Inspired by Julian Argüelles and Dave Holland octets, Simon’s compositions boast lyrical and interweaving horn lines, with interspersed guitar and piano breaks, held together by a melodic and distinctive bass line. ‘Read all about it’ is very much composed with that framework in mind, featuring a guitar break from founding guitar member, Michael de Souza. Equally groove inspired is ‘Vibe E’, which alto saxophonist Ben Lowman absolutely nails with his Maceo Parker inspired chops, that provided a killer solo on yesterday afternoon’s set. With barely a year since the EP launch, Read is already envisaging his next album and funding an octet tour to coincide with its release. We wait to see what Read manages to produce in the future years to come. For now, the octet are set to perform at the Chapel Allerton Arts festival and Wakefield jazz club, but I feel like we’ll be seeing a lot more of him at other major British festivals in the years to come.